The 2018 NUU Mobile G2, although rocking a high-resolution camera that might catapult it to a spot near some of the best photography-first smartphones around, is only a middle-class smartphone when it comes to hardware pros and cons. Powering its specs is an octa-core MediaTek engine (The exact chip was not specified at the time of this technical review) clocked at only 1.5GHz , while several competing eight-core smartphones use engines clocked at 2GHz or higher. That being said, its 4GB RAM count hits the mid-range bullseye, at least as of this Phonerated write-up. Another slight con is the fact that it settles for only 64GB of inbuilt memory , if only because a few other models with comparable camera setups start out with 128GB of native memory. The G2, however, provides some sort of remedy through its 128GB microSD card slot. Jumping over to its pros, the NUU G2 boasts a dual rear camera setup consisting of a 20-megapixel primary cam and a 2-megapixel deputy cam for depth-of-field analysis. 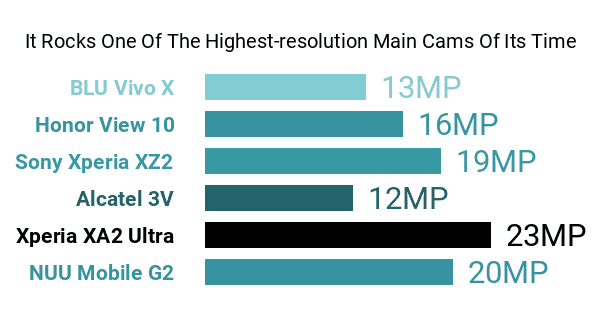 20 megapixels, by the way, was among the highest main cam resolutions observed in the middle-class department when this model hit the market. Up front, it touts a respectable 13-megapixel camera for selfies, under which sits its 6-inch (5.99-inch, to be exact) display whose 18:9 aspect ratio is reminiscent of the facades of some of the best large-screen smartphones available. 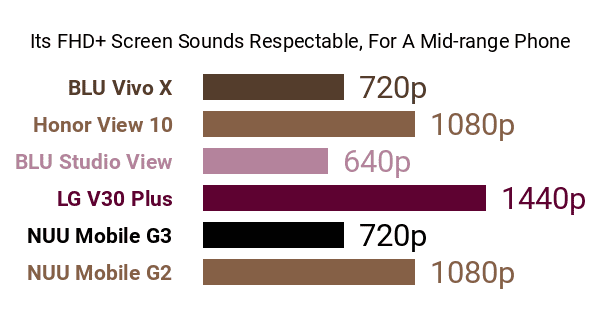 Its aforementioned In-Cell display comes with a Full HD+ resolution (2160 x 1080), which, although shies of the 2K-1440p screens of some full-fledged flagships, is way more reassuring than the 720p-only displays offered by some of its rivals in this Android class. Despite its middling hardware components, the NUU G2 is generously powered by a 4000mAh battery that's accompanied by the brand's self-branded Express Charging fast-charge technology. 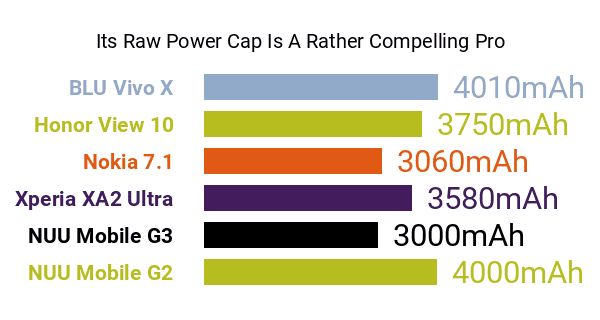 In comparison, some of its close rivals offer no more than 3500mAh of raw battery power. Joining its pros and cons are the Android 8.0 Oreo ecosystem and two SIM card trays, rounding out the G2 as a solid mid-end option for both photography enthusiasts and power-hungry users.